An elderly woman was struck by a vehicle on Mitchell Dr. in Walnut Creek, in front of the Contra Costa School of Performing Arts. The woman was struck in the crosswalk, according to firefighters. She was transported to the hospital, her condition is currently unknown. Check the drivers cell phone. If it was being used, lock him or her up for a very long time. Why… checking phone means nothing cause they can be on phone via Bluetooth or speaker and perfectly legal. Just cause someone’s on phone don’t mean crap. They can be eating a burger and holding a drink and that don’t mean crap either. Cops can’t tell by phone records if driver is on speaker, Bluetooth or phone up to ear. Check the old ladies story, maybe she went off curb on a red light which in my book is her fault even if in a crosswalk. Just cause someone is hit in a crosswalk don’t mean it’s a vehicles fault no matter what. I’ve seen court cases where driver was not at fault at all hitting someone in a crosswalk. There is no red light at that crosswalk Einstein. 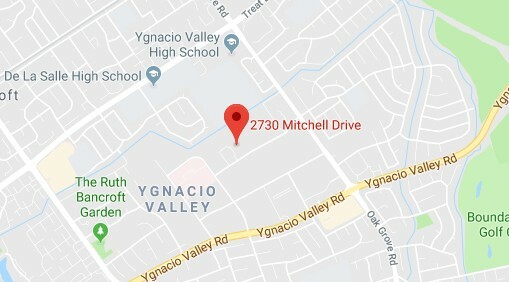 @REastbay is right not left I checked to see if there were any traffic lights at 2730 Mitchell Dr. There is not. What that means is that she did not cross the street against a red light. What this also means is that, because she was struck in the crosswalk, the driver broke the law by violating CVC 21950(a). More than likely the person was distracted, otherwise that person probably would have seen a person in a crosswalk. REastbay is right not left, comment it is actually illegal to have a phone in your hand while driving, even I you aren’t on it. It is considered a distraction, you are supposed to have nothing to distract you while driving. Grandma Peg is a sweet loving person who has been doing this for a while, the red Honda was speeding well beyond the speed limit, plus it was a school zone. there were kids about to cross when it happened. the driver was obviously distracted, she was wearing a neon vest and a big red sign that said STOP. The elderly lady struck today “Grandma Peg” is a dear volunteer at Contra Costa School of Performing Arts on Mitchell Dr. On Mondays, she acts as a crossing guard because all of the students get out at the same time and she helps them all get across Mitchell Dr safely. As such, she wears a vest and crossing guard gear. Any assumptions that it was her fault are incorrect. Drivers should be more careful, especially in busy school zones. Prayers for this sweet lady. Thank you for sharing about her. Yes, thank you for sharing this info. a shame to be hurt like this while serving and helping others. Peds walk out into crosswalks like they’re protected by 20f thick steel reinforced concrete barriers. Drivers texting or (gawd knows what) is the norm. Before I go blaming either, I’d like the facts. Where are the police officers? I cannot recall the last time I saw ANYONE pulled over in WC for ANYTHING. They do a swell job on the parking meters. I’m guessing that’s where they get most of their revenue as they aren’t doing squat for all speeding, red light running, cell phone using, distracted drivers. Apparently the only expert here is you East Bay…. maybe take a breather. From what I understand from my son who attends the school, it was also a hit and run. It was. I was in the school when it happened. There was no car. And does the law tell us how are we supposed to tell if they’re a pediatrician, or some other kind of doctor? Are Pediatricians really more important than Pedestrians? Pedestrians don’t always have the right of way, either. Childish, but what else does one expect. Pedestrians DO NOT always have the right of way. That is a dangerous falsehood. I would guess that countless lives have been sacrificed to this urban myth. Who would spread such evil misinformation? Perhaps the Devil himself. Day in, day out, people walk in front of moving vehicles, thinking they are righteously protected by some unalienable right of way over all other traffic. Were that the case, there would be no such legal concept as jay walking. We wouldn’t need crosswalks, because the whole world would be one big crosswalk. There would be no “no pedestrian” signs. Police would not run periodic sting operations at locations notorious for pedestrians violating the right of way of vehicle traffic, and they would not punish them with fines for not yielding the right of way to said vehicles . There would be no “Do Not Walk” signals. While I agree that drivers have a humanitarian obligation to do everything under the sun to avoid striking a pedestrian, that is not the same as “pedestrians always have the right of way”. In practice, the two are almost indistinguishable, but it is important to understand the difference. The slim margin of difference can be measured in thousands of lives every year. The view that we have a vast industrial civilization with millions of cars barreling around at high speed, and pedestrians have an absolute right to walk in front of them at any time is just absurd. Think it through a little bit. Give a little credit to the writers of the California Vehicle Code. They addressed all this fairly well. To the point of poor Grandma Peg, I have seen her in action many times. She does an excellent job. Better than most, even. She not only gives the kids safe passage across the crosswalk, you can tell she is really managing the larger traffic situation, which improves the safety of the whole area, not just the crosswalk. My heart hurts for her. She is the best among us. Pedestrians DO have the right of way in a crosswalk. That’s what a crosswalk is. A place where pedestrians have the right of way, as opposed to other places where they may not. Doubly so with a “flagman,” in the vernacular . Stop spreading the canard, “Pedestrians always have the right of way.”. It is a good notion for drivers to have while behind the wheel, unfortunately it has morphed into a rallying for brain-dead pedestrians to “assert their rights” by stepping into the path of a moving vehicle. It kills people. No, pedestrians do not always have the right away. Not if they do not cross at a crosswalk or dart into a crosswalk too late for traffic to stop or against a red light. Pedestrians do NOT always have the right of way – it all depends on where they are trying to cross a street. That being said, there are FAR too many pedestrians that just walk blindly into crosswalks or intersections without even ONCE glancing up to see what traffic isdoing and whether or not they may be at risk. This is the result of the “the pedestrian always has the right of way” mentality, and it doesn’t WORK because drivers are not always paying full attention and may be looking elsewhere when a pedestrian steps out into the street. Protect yourselves People!! You are only flesh and bone! I’d say the only law that always prevails is the law of physics. Here is hoping the sweet crossing guard makes a full recovery. Shame on the person that left the scene if thats truly what happened. I am guessing that the cause will be determined to be an idiot that ran into a crossing guard, in a marked crosswalk, in a school zone. But, hey! I’ve guessed wrong before. Driver pulling out of Calicraft by any chance? She was not struck by a car. She is the volunteer crossing guard for the Contra Costa School of Performing Arts. She was crossing the kids and an SUV entered the crosswalk. She jumped out of the way to avoid being hit. She is hospitalized & WCPD found the driver. This update came from the Principal of the school. update on her condition, she wasn’t actually hit, but it came close enough to her that she had to jump out of the way, causing her to injure her head, back, and fracture her fermur. she has to go into surgery tomorrow, but is in a good state mentally. Good luck to her in her surgery. A fall like that is very serious for an elderly person. I hope she makes a speedy recovery without any complications.